Manchester United vs Valencia: Manchester United host Valencia at Old Trafford looking to return to winning ways by extending their unbeaten start in the Champions League. Jose Mourinho’s side crashed to yet another damaging defeat at the weekend, this time losing 3-1 to West Ham. That leaves the club with just one win inform games; with their last victory coming in this competition. The United boss made some big selections decisions, leaving both Alexis Sanchez and Jesse Lingard out of their 18. The Chilean has struggled for form since his move from Arsenal last January; he’s a shadow of the player he was for the Gunners. Sanchez, like United, seems to lack any rhythm or understanding to his play at the moment, which typified where the club are. Mourinho’s side have an identity crisis, which is not something you usually say about his side. Granted, the Portuguese’s philosophy is contrasting to United’s of old, but they aren’t even looking like a Mourinho side currently. Defensively, they are a shambles. Even though Mourinho was desperate for a centre back in the summer, they should be performing better than they are currently. He has already spent over £50M on CBs, as he brought Victor Lindelof and Eric Bailly to the club, who have both flattered to deceive. Valencia will be desperate to pick up a result in Manchester, having lost their opening games 2-0 to Juventus. In the league, they are unbeaten in five, although they won just one of those games. They currently sit in 14th place, with only eight points from seven games, leaving them four points behind the top four. Their main issue has been scoring goals, they’ve only conceded six in those seven matches, but notched only six. Rodrigo Moreno was their main supply of goals last year with 20, however, he has just one this season, which was six matches ago. Slavko Vincic the referee for this game. The Slovenian took charge of Burnley’s Europa League tie with Olympiacos earlier this season and officiated two Champions League games last season. In 160 international matches, he has an average of 3.85 cards per game. Therefore, I would advise a maximum of 50+ total points for this fixture. The one silver lining for United is that Valencia are in just as poor form as them. As a result, this offers them a fantastic opportunity to turn their season around and grab a second Champions League win in as many games. 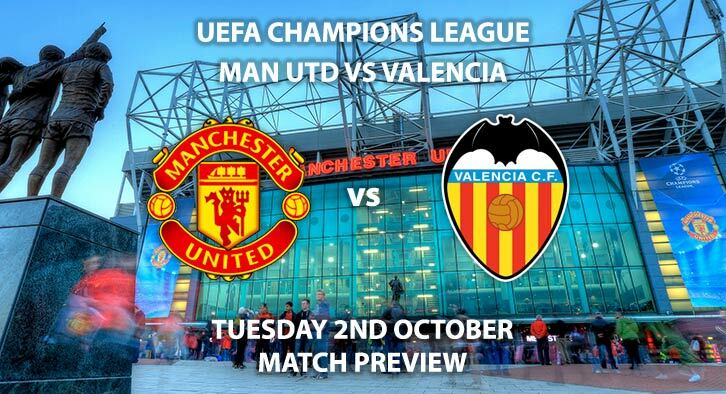 Manchester United vs Valencia will be televised live in the UK on BT Sport 2 with kick-off at 20:00 GMT. Correct Score – Manchester United win 2-1 – (link no longer available). Both Players to Score – Rodrigo & Marcus Rashford – 17/2. Correct Score Group Betting – Manchester United to win 1-0, 2-0 or 2-1 – 7/4. (NAP). Price Boost – Romelu Lukaku to score a header – 7/1. Popular Bets – Lukaku & Batshuayi to score and Shaw & Gabriel to be carded – 80/1. Odds and markets last updated on Tuesday 2nd October 2018 @12:34 GMT. Keep checking back to see if there’s any updates to markets – the time stamp in the previous sentence for when we update tips on this page will be updated. Remember to keep visiting the tips and preview area for further updates and betting previews around this weeks other European games.